1A. R. Dhaini (e-mail: adhaini@uwaterloo.ca) and P.-H. Ho (e-mail: pinhan@bbcr.uwaterloo.ca) are with the Department of Electrical and Computer Engineering, University of Waterloo, Canada. 2X. Jiang (e-mail: jiang@fun.ac.jp) is with the School of Systems Information Science, Future University-Hakodate, Japan. 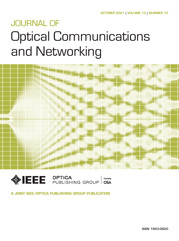 This paper proposes WiMAX-VPON, a novel framework for establishing layer-2 virtual private networks (VPNs) over the integration of WiMAX and Ethernet passive optical networks, which has lately been considered as a promising candidate for next-generation fiber-wireless backhaul-access networks. With WiMAX-VPON, layer-2 VPNs support a bundle of service requirements to the respective registered wireless/wired users. These requirements are stipulated in the service level agreement and should be fulfilled by a suite of effective bandwidth management solutions. To achieve this, we propose a novel VPN-based admission control and bandwidth allocation scheme that provides per-stream quality-of-service protection and bandwidth guarantee for real-time flows. The bandwidth allocation is performed via a common medium access control protocol working in both the optical and wireless domains. An event-driven simulation model is implemented to study the effectiveness of the proposed framework.